The new AMD FirePro™ V4900 professional graphics - an entry level professional graphics solution using AMD's newest generation of graphics architecture. The AMD FirePro™ V4900 is powered by many exciting new features and technologies. Under the hood is a new generation GPU, backed by 480 stream processors capable of 0.768 Tflops of Single Precision compute power and 1GB of blazing-fast GDDR5 memory. In output, the AMD FirePro™ V4900 has two DisplayPort outputs and one dual-link DVI output built in. 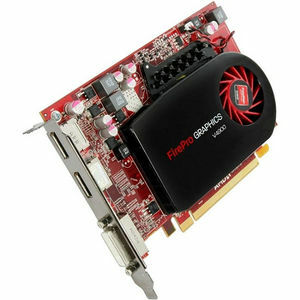 In addition, for users who require small form factors yet still desire high performance, performance that professionals have come to expect in a small and sensible half-length graphic card design.